The Dow had its worst week in two years. Why? Wall Street just suffered the worst day of the Trump presidency. The Dow closed down 666 points, or 2.5%, its biggest percentage decline since the Brexit turmoil in June 2016 and steepest point decline since the 2008 financial crisis. A strong jobs report showed wage growth is finally starting to pick up. That's great news for workers, but it reinforced investors' concern about inflation and the bond market. "It's all about rates. 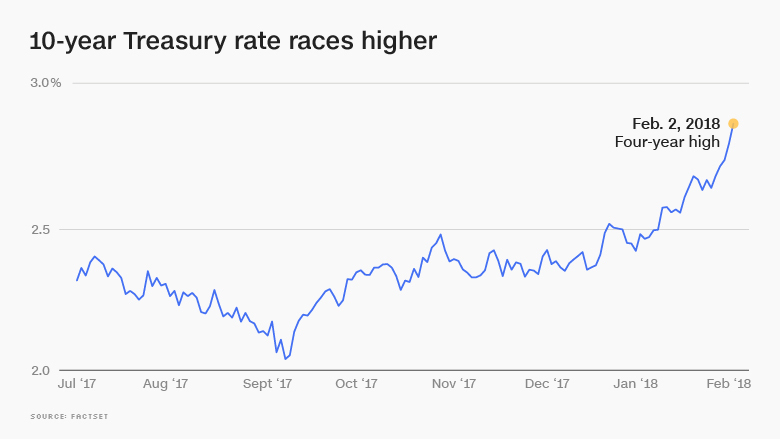 Asset prices and the economy have become addicted to low rates," said Peter Boockvar, chief investment officer at the Bleakley Financial Group. "Sentiment got euphoric. There is more froth that needs to be taken off." The sell-off knocked the Dow well below 26,000. Both the Dow and S&P 500 suffered their biggest weekly drops since early 2016 -- roughly 4% each. Political turmoil is adding to the uncertainty. Market analysts pointed to the clash between the Trump administration and the FBI as another concern. "There looks like a breakdown of the institutions in our country," said Ian Winer, head of equities at Wedbush Securities. "No matter what side you're on, that's not good." While the point decline on the Dow was large, it paled in comparison with the scary days of the financial crisis. Friday's decline was 2.5%. The Dow plummeted nearly 8% on a single day in October 2008. The stock market is much calmer these days, thanks to a strong economy, record corporate profits and the huge business tax cut enacted by President Trump and Republicans in Congress. Even with this week's slump, the S&P 500 is just 3.9% below its all-time high. But the tranquility that has defined Wall Street's stunning rally since the election has been punctured. The VIX (VIX), a measure of market volatility, soared 55% this week. January's jobs report didn't settle the market down. The economy added 200,000 jobs in January, and wages grew at the fastest pace in eight years. But if wages grow too fast, they could eat into Corporate America's record profit margins. The other concern: Wage growth could be a sign that inflation, which has been mysteriously low for years, may heat up. That would force the Federal Reserve to raise interest rates faster than investors may be comfortable with. Those worries are showing up in the bond market. The 10-year Treasury yield reached a four-year high of 2.85% on Friday. It was at about 2.4% at the start of the year. Some investors are worried rates could climb high enough to slow the economy by raising borrowing costs. They also worry that higher returns on bonds will make stocks look less attractive by comparison. "Those rising rates are making it harder to say there is no alternative to stocks," said David Kelly, chief global strategist at JPMorgan Funds. Former Fed Chairman Alan Greenspan said this week that both stocks and bonds are in a "bubble." Related: Are GE's days on the Dow numbered? Of course, this week's slide does little to dent the overall gains the market has achieved since President Trump's victory. The Dow and the Nasdaq have climbed more than 40% apiece since the 2016 election. The S&P 500 has advanced for 10 consecutive months. That hasn't happened since 1959. Even stock market bulls have long said that a pause -- or even a dip -- would help prevent the market from overheating. "We've just gone too far, too fast," said Art Hogan, chief market strategist at B. Riley FBR. "We had this perfection of 2% higher every week -- and that really is just not reality." Some market analysts said the political controversy over the release of the disputed GOP memo is rattling Wall Street. "You've got trouble in the Department of Justice and the FBI at the senior level," said Jeffrey Saut, chief investment strategist at Raymond James. "It all hit when the market was ready to go down anyway. It just accelerated it," Saut said. Wedbush's Winer said the biggest risk is that Robert Mueller, the special counsel investigating Russian interference in the election, is fired. "If Bob Mueller is challenged in a firing, or a prelude to a firing, then you're going to have a problem," he said. Other market analysts think Friday's drop has little to do with Washington. "We're not drawing a connection between the political headlines and the market. Valuations for stocks are high, and we were due for a pullback," said Luke Tilley, chief economist for Wilmington Trust. The latest corporate earnings, which typically drive stock prices, left the markets unimpressed. Shares of Google parent Alphabet (GOOGL) slumped 5% even after the tech behemoth posted its first $100 billion sales year. Disappointing iPhone sales left Apple (AAPL) down 4%. ExxonMobil (XOM) sank 5% after its results widely missed expectations. Selling was widespread. Amazon was one of just 27 stocks in the S&P 500 to finish the day higher. "You've had a stock market that's gone absolutely crazy based on tax reform juicing earnings," said Winer. "And numbers are coming in that are OK, but not blowing the doors off." 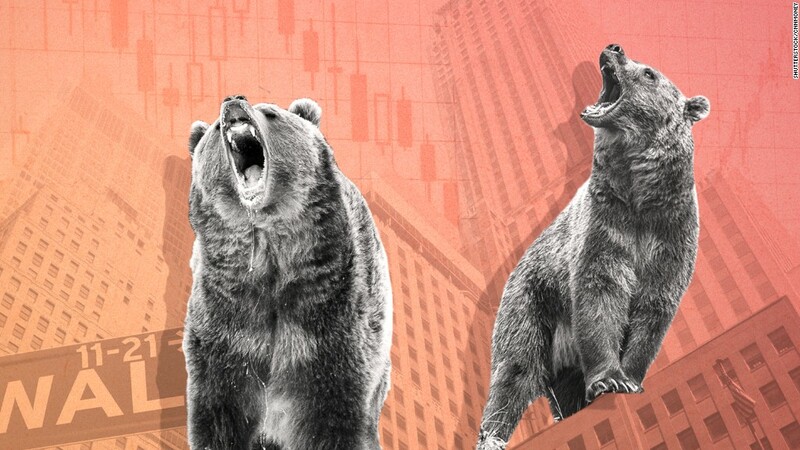 The question now is whether this market turmoil will persist into next week, or whether investors have been waiting on the sidelines come in to buy after the dip. Tilley said his team expects there will finally be a full-blown correction -- a 10% pullback from the recent highs. "But don't expect a bear market unless there's an actual downturn in the economy," Tilley added. --CNNMoney's Chris Isidore and Paul R. La Monica contributed to this report.